"Essential for the Transportation business "
The program displays a lot of information and its simple enough to use. Sometimes there is too much information on screen. At times this program freezes up and requires users to log off the server and log back in to become usable. Also the word integration goes wrong and has a pop up window comes with an error. "Does a Lot of Things Well, but Could be Better"
The TMW.Suite products provide a fairly current, .NET, look and feel. Microsoft stack means it's familiar to users and administrators. Easy to train users. Layouts can be customized to restrict access to pages and fields. Existing interface with Microsoft Dynamics GP for accounting makes implementation less time consuming since a custom AR/AP/GL interface does not need to be developed. Support can be slow to respond and completely fails to meet their SLA at times. Some applications seem slow. Seems that there are some core features of the product that could be improved or added rather than focusing so much attention on emerging technologies. Implementation can be tedious (considering the simplicity of the product) due to their methodology and lack of motivation. It is completely up to the customer to drive the implementation and keep TMW progressing. Have a good project plan stick to it. TMW has allowed us to interface with other applications and systems to eliminate man-hours performing repetitve and mundane tasks. We can track loads via applications that ping driver cell phones, customers can tender orders via EDI or web portals, we can send loads to freight boards directly from the UI rather than retyping. "Great progress, but still clunky and not with the times"
There are too many dependencies on old and unsecured software like silver light or IE. The layout and design of the software is still clunky and inefficient and feels like it was designed by a high school student in the 90's. There are still a lot of glitches and bugs in the software that make day to day work a hastle. Good product, requires more end user training than you'd like. "TMW: The Pros and Cons"
I think that the assignment history function serves me best. It allows me to reference all of a drivers applicable information by simply typing their name in. In addition, despite the inefficiencies listed below, the planning worksheet is very helpful when it comes to time sensitive shipments. TMW is great for keeping real time data (if coupled with PeopleNet), which has allowed us to monitor driver locations and provide said locations to our client (BMW). It gets done what needs to get done - the process of optimizing orders, tendering loads, status updates, all the way through invoice reconciliation. Workflows are best for over-the-road type fleets. Workarounds or inaccurate data produced with short-haul (shuttle) runs and it's clunky when used for a hub-and-spoke distribution network. Overall, we've made many many modifications to the system to get orders to flow through it in a reasonable fashion. And once you modify it, upgrades suddenly become much more complex. Keep your options open when deciding upon a TMS and consider what context you're going to use it in (shuttles, OTR-based operations, dedicated distribution, etc.). Select your TMS carefully from there. Tendering loads to assets, invoicing, dispatching. Historical data is there, although the analytics and reporting is nothing to scream about. "Great product for all your Transportation needs." Our company utilizes TMWSuite as an all-in-one product for dispatching, file maintenance, scheduling and accounting needs. It has excellent customization and is very moldable to your business needs. One thing I would love to see improved is the overall user experience and user interface. I feel as thought the look of the program is a bit antiquated and could be improved. TMWSuite helps us maximize the scheduling and efficiency of our fleet of tractors. It is nice to have a software that is fully integrated across multiple departments so we have an all-in-one central location for transparency. "Workable software, very locked down"
Software works, low learning curve , there are many customizable views and exports which are useful. Not a lot of options for power users. The overall core functions are great, but in order to customize non built in references, you can't add in your own, another dept needs to put them in. Should have ability to modify modules like planning worksheet myself , not submit a ticket to development. Integrating multiple business units to a seamless One size fits all viewer for all assets on and off road. TMW is not user friendly. Difficult to customize and it takes too long to use the planning and dispatch functions. The system does not interface well with Peoplenet elogs either, and this is a growing concern at the company where I currently work. 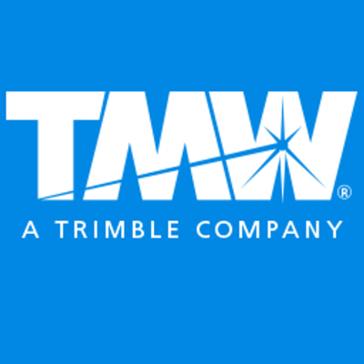 "Customer Service Representative using TMW on a daily basis for managing customer shipments." TMW is fairly clean and modern in design. I think it is easy to locate the information needed on each menu and it is flexible to layout preferences as well. Sometimes TMW is too rigid - when there are exceptions to the norm, there can be a lot of hoops to jump through. However, this is a good fail safe feature in a way! This is the first TMS I have used so I do not have much to compare to, but i think TMW helps more than hinders my every day work. "Godo system, just has some issues"
Just stick with it, once you work everything out it will be a great tool to use company wide. Everything can be synced together. "One of transportation best software"
"Efficient and effective but unreliable sometiems"
I like the capabilities it gives me such as being able to optimize and makes things as efficient as possible. When I was using it I used it for managing things from point a to b in the most efficient manner.. I like the ease of use and the ability to use for multiple departments. I dislike not having a go to manual with clear instructions of use. Keep up with the upgrades to utilize all of the features. My company uses TMW for invoicing, settling, dispatching, record management, and more. I have realized the benefit of keeping historical data. The system seems to need updates. Many times after using it for a while it just closes and you have to reopen and start all over. * We monitor all TMW Suite reviews to prevent fraudulent reviews and keep review quality high. We do not post reviews by company employees or direct competitors. Validated reviews require the user to submit a screenshot of the product containing their user ID, in order to verify a user is an actual user of the product. Hi there! Are you looking to implement a solution like TMW Suite?